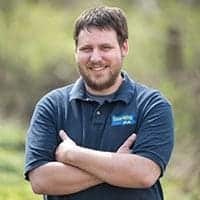 During my travels around Pennsylvania, I’ve been to well over 100 waterfalls, and without a doubt, Shohola Falls is easily one of the most impressive waterfalls in Pennsylvania. 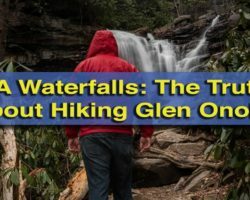 It’s also one of the least known and easiest-to-reach waterfalls in the Poconos. Shohola Falls is located along Route 6, 10 miles northwest of Milford, Pennsylvania, in State Game Lands 180. State Game Lands 180 is an 11,000-acre area of protected land which is dominated by Shohola Marsh Reservoir and its surrounding marshes. Shohola Creek flows into the lake and then flows out of the lake at the dam on the northeastern corner of the lake. Shohola Falls is just below this dam. The dam seems to have little effect on the flow of the waterfall as it is often flowing, even during the drier months. Overlooking Shohola Lake and the dam above Shohola Falls. This constant flow of water travels over this impressive waterfall that is roughly 75 feet wide and 50 feet tall. I’ve actually seen sources that say the waterfall is 70 feet tall, but that doesn’t seem correct to me. 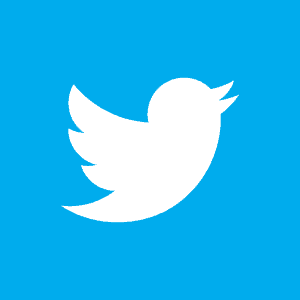 If you happen to know the height or width for sure, please comment below and let me know. Regardless of the height, Shohola Falls is incredibly powerful and beautiful. The sheer amount of water that flows over this waterfall, even when others in the area are low, is very impressive. 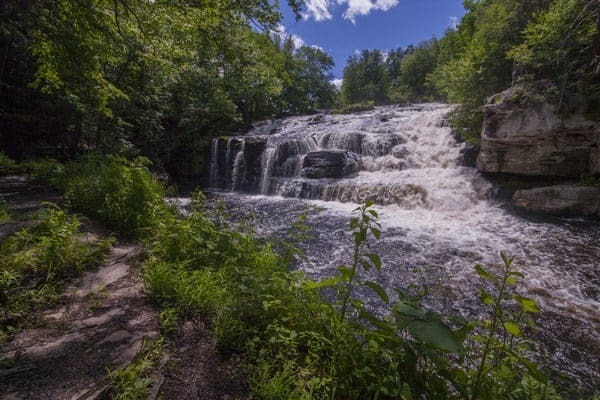 The Shohola waterfalls can be viewed from three sides thanks to a 90-degree turn that the creek makes just below the bottom of the falls. The best views are from the ledge directly in front of the waterfall, giving you a head on view of the waterfall from about 20 feet above the water. Shohola Falls as seen from the narrow ledge in front of it. If you opt to go out on this ledge, use extreme caution. The ledge is only a few feet wide in places and slants slightly downward to the water. The ledge is frequently wet with spray from the waterfall, making it quite slick in places, especially when it gets icy during the wintertime. The ledge can be accessed from the eastern side of the waterfall. 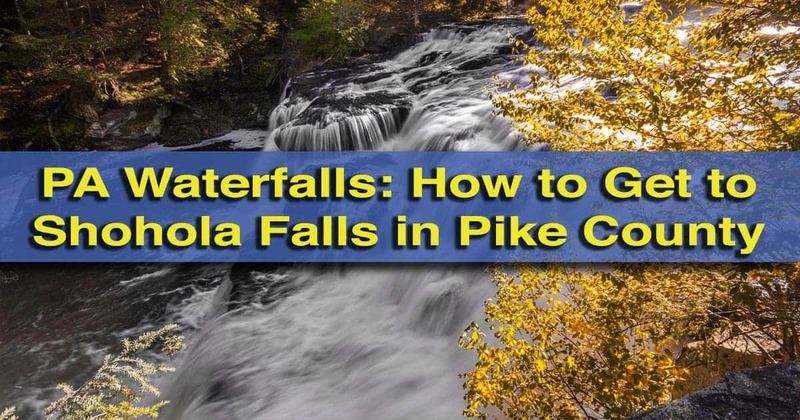 This area offers the quickest access to Shohola Falls and the ability to see a side waterfall that flows when water levels are higher on the main waterfall. This small waterfall is to the side of the main flow of Shohola Falls. The opposite side of the falls can be accessed from a parking lot directly off of Route 6. In fact, I made the mistake of only visiting this side when I went to Shohola Falls for the first time. From here, it’s a short walk along an open field to a trail that leads you along the water to several stone observation points. While it takes a bit longer to get to the waterfall from here, these observation areas provide nice vantage points for those that don’t want to get too close to the water. One of the observation areas for Shohola Falls on the waterfall’s western shore. 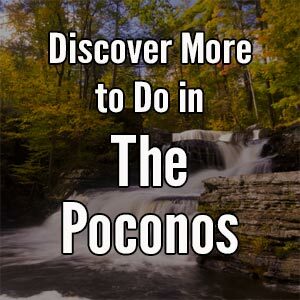 Without a doubt, a visit to Shohola Falls should be on the radar of any nature lover visiting the Poconos or traveling Route 6. 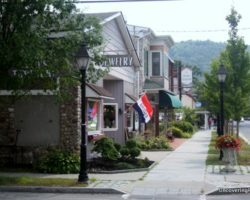 Its easy accessibility from this major Route, as well as short distance from Milford and the Delaware Water Gap, make this a must-visit waterfall for those in the region. 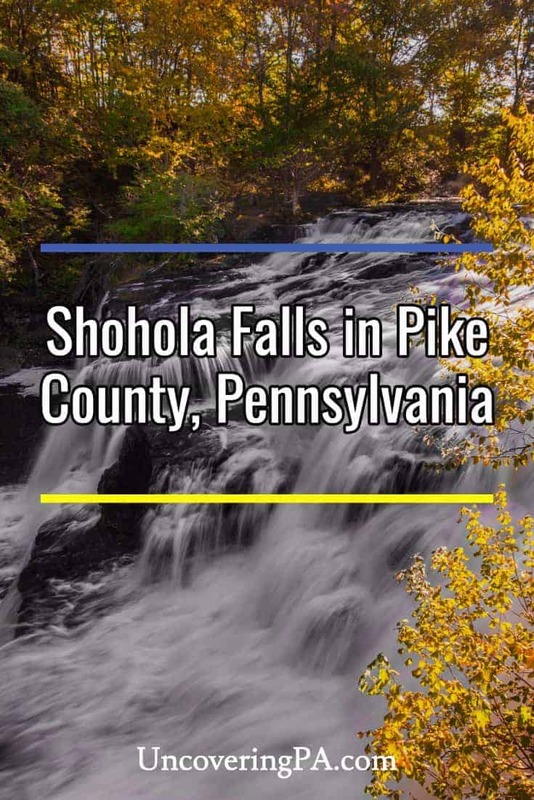 Shohola Falls is located along Route 6 in Pike County, Pennsylvania, 10 miles west of Milford. After following those directions to Shohola Falls, PA there are two options for parking to see this waterfall. The eastern side of the waterfall can be reached from a parking area off of Brooks Road, which is before the bridge if traveling west. While this road might look like a private road, it also leads to the state game land’s parking area. The coordinates for this parking area are 41.390504, -74.969160. Looking out at the top of Shohola Falls. From here, follow the trail off of the parking lot that heads downstream for just a minute or two. To access the narrow ledge, follow the trail past the large rock as the trail goes downhill and then uphill to the ledge. Again, if you opt to go out on the ledge, please use extreme caution, especially if it is wet. Do not attempt to go out on it if the ledge is at all icy. 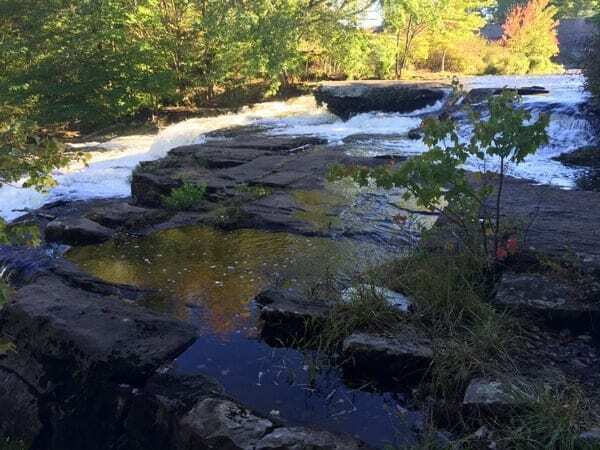 To reach the western side of Shohola Falls, cross the bridge over the creek (if traveling west) and park in the state game land’s parking area that is immediately after it to your left. When you enter the parking area, park in the far left corner of the lot. The coordinates for this parking area are 41.391771, -74.971643. A side view of Shohola Falls from the western shore. 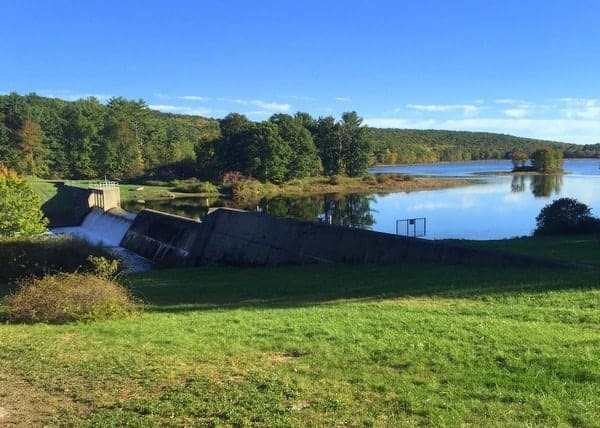 From there, walk through the open field towards the lake and the dam. Near the water’s edge, you should see a trail heading into the forest and downstream. Soon, you’ll come to a stone wall and two observation areas. 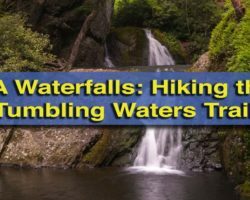 Want to see more of Pennsylvania’s best waterfalls? 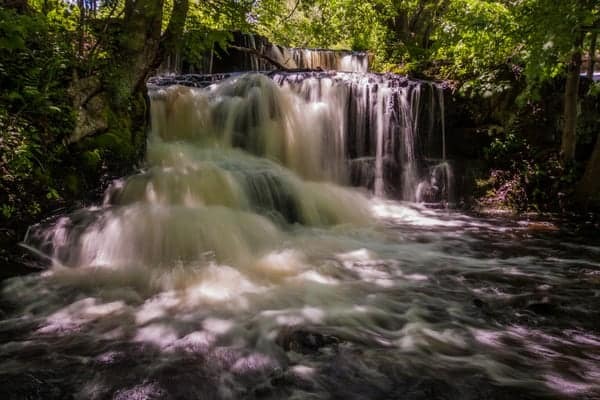 Check out our Pennsylvania Waterfalls page! 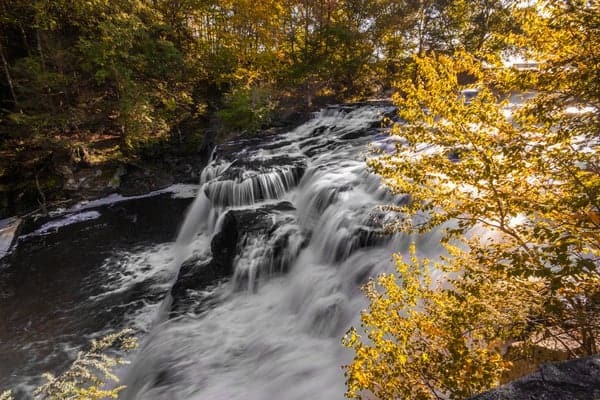 You can also check out nearby waterfalls like Resica Falls, Raymondskill Falls, and Tanners Falls. Great article and beautiful pictures. 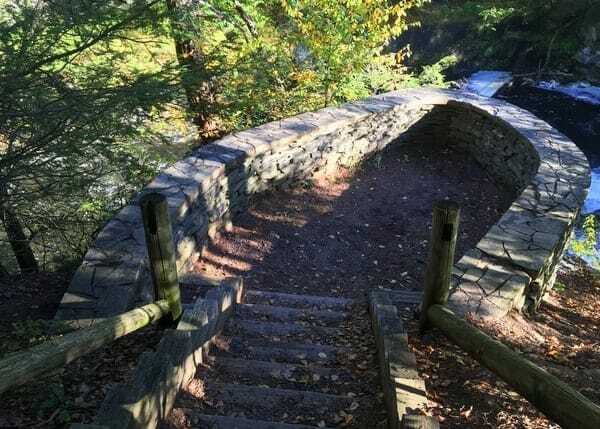 Our son is currently in process of his Eagle project, which will be replacing the stairs down to the falls on the eastern side of the falls. We had our wedding pictures here and he’s grown up fishing here. The falls mean a lot to us and we’re looking forward to helping make it that much better for everyone to enjoy. That’s great to hear! Thanks for the hard work. Grew up in Shohola and loved visiting the Falls!! Always a solitary place in the 70’s and early 80’s. Thanks to your article, I found both turns and parking lots (east and west) when we visited Shohola Falls for the first time today. 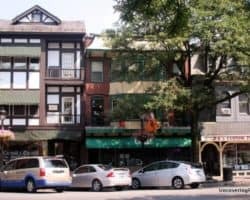 I really appreciated your posting the coordinates… there is no way I would have found the gorgeous east side just by the verbal descriptions others posted about the signs for the old Inn. The road in toward the parking lot was in reasonable condition, no big potholes or any problems. The stairs were in good condition…sounds like that is thanks to Meghan Rinkel’s son! With the recent heavy rains, the falls were like Niagara today, in late August. Yet it has been dry enough that those ledges at various spots were not at all slippery. With a little attention, it was easy to get a great view. Many thanks!